When Mum ran races when I was a kid, I sat in the car reading Nancy Drew until 5 minutes until the approximate time she’d given me for her finishing. I’d then wander to the finish line, clap a bit and then wait for her to give me half her finisher’s Mars Bar. Easy. I was a much more involved spectator for a marathon earlier this year, and it was a touch harder. Wear appropriate clothes for doing a lot a lot of standing about in whatever weather it is. Gloves and tons of socks for colder climes, plenty of sunscreen and a hat for hotter places. It’s easy to know what you’d wear running, but hanging about is a bit odder. Make sure you’re not going to get stuck on one side of the racers. Google maps is NOT your friend at this point – download a pdf of the race route, or even, a paper copy for reference. So retro. 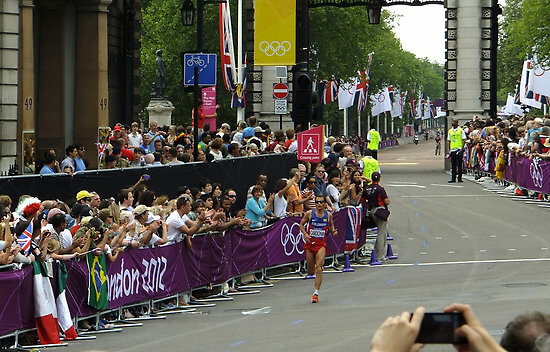 In long races, people end up off pace – allow some leeway either side of his or her anticipated times crossing mile markers to do a supportive wave. Otherwise you’ll be standing for hours at the 12.6 halfway marker worrying that your pal has collapsed in a chafed heap somewhere when in fact they’ve sped along happily before you got there, wondering what coffee shop you’ve got lost in. It’s not just athletes that need fuel – make sure you’ve got some granola bars with you. Be ready for anything at the finish line. Some people are frighteningly breezy at the finish line (ahem, Adam) but I saw tears, lone wolves and cheering hoards. Your pal could be ecstatic, ravenous or utterly normal. Be amenable to anything that they want to do, as long as it also involves your making sure that they’re gulping hydration. Be prepared to be an interested participant in listening to them talk about the race mile by mile. You’ll learn something for your next one! Note: If you don’t fancy spectating or you’re injured/don’t fancy running, you could always consider being a volunteer on race day. Mum did this earlier in the year and discovered that there’s a lot goes on behind the scenes to make it all happen. Hmm – my daughter sounds very like you were! She’s always first into the goody bag at the end!!! These are great tips – my husband and 2 kids are very good at coming and supporting me. They managed to see me 6 times at the London Marathon this year – they deserved medals too! SIX times? What troupers!! And congrats on London – sounds like you had great support too.